In combination with this comprehensive strategy, WuXi’s Laboratory Testing Division provides end-to-end customer support for regulatory filings. Many startups, midsize companies, and even large pharma firms are not fully equipped to handle the entire filing process. To help address this gap, LTD, in 2016, created the WIND (WuXi Investigational New Drug) program — to support clients in the preparation of investigational new drug applications. What’s unique about WuXi’s preclinical testing platform is that it combines world-class CRO services with cross-functional program management and global regulatory expertise to support Investigational New Drug (IND) applications. With capabilities in toxicology, DMPK, pharmacology, CMC and analytical services all under one roof, the Laboratory Testing Division can support the full scope of its partners’ drug development programs, from IND-enabling studies to document preparation and submission. While LTD works with both large and smaller companies, the WIND program is ideal for smaller biotechs who want a one-stop shop with an experienced CRO. After all, small biotechs have become the growth engine for the pharmaceutical industry, supplying the majority of the drug candidates to the big pharma companies. Through the WIND program, LTD is also striving to help bridge the Pacific gap to accelerate preclinical drug development. For example, in the last few years, China has seen a major boom in innovative drug development, while the pharmaceutical industry in China has been rapidly transitioning from a generic drug-focused industry to an innovative drug development industry. The new policies of the CFDA have made global pharmaceutical companies more welcome in China, both for market access and patient access. Now global companies can bring their ex-China trial data to regulatory filing with CFDA, saving years of time for marketing approval in China. While the industry and regulatory agencies work to bridge the Pacific gap to accelerate preclinical drug development, LTD continues to foster growth across its entire platform, enabling its scientists to transform ideas into the best healthcare products, and ultimately improve human life. The WIND program is a good example of how the Laboratory Testing Division continually innovates even within its existing portfolio to provide ongoing service enhancements for clients. 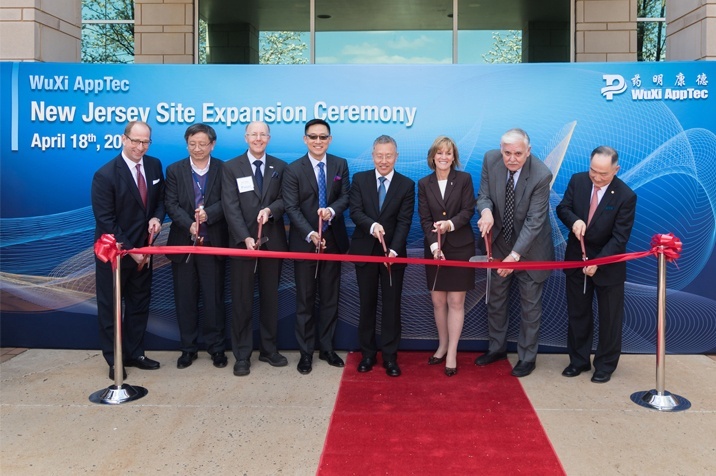 Overall, WuXi works with more than 3,000 leading pharmaceutical, biotech and medical device companies worldwide, with many big pharmaceutical clients in New Jersey. In the last four-and-a-half years, the Laboratory Testing Division has evolved into a fully integrated testing platform supporting customers across the full scope of drug discovery and development and reflecting the company’s “Platform to Patient” philosophy. LTD provides testing services that cover the clinical testing continuum – drug development, medical devices and clinical diagnostics. The most recent addition to the continuum, clinical diagnostics, is part of a recent joint venture with the renowned Mayo Clinic. The purpose of the partnership is to accelerate development of novel esoteric tests that will be offered in both company’s respective markets, benefiting patients in China and around the world. Together, the three service sectors create a platform that enables WuXi’s partners and clients to achieve more rapid and targeted innovation. The pharmaceutical industry is experiencing promising and accelerated growth that is being driven by a number of factors. The global economy is expanding at a healthy rate and the world population is increasing rapidly. At the same time, the global population is aging, leading to greater demand for medications to treat chronic diseases. As emerging economies mature, and the middle-class expands, more people can afford, and expect, access to advanced therapies. In addition, the blurring of the lines between technology and healthcare, including advances in science and the emergence of artificial intelligence, big data, and blockchain, are facilitating the discovery and development of next-generation treatments. To achieve success today, WuXI’s pharmaceutical clients must do things faster, cheaper and better. WuXi’s Laboratory Testing Division must provide customers with better service, better quality and better customer experiences. The path forward involves innovative, complex, technical, collaborative and transparent partnerships; collaboration and the global enterprise are key to innovation. Given this combination of growth drivers and challenges, it is no surprise that WuXi is experiencing continually increasing demand for integrated services from across the global pharmaceutical industry. WuXi’s global partnerships are driven by the need to innovate and identify more efficient and effective ways of working. While WuXi’s headquarters are in Shanghai, the company has 28 operations around the world and a relentless commitment to further focus on its mission to accelerate growth of its enabling platform. In 2017, 36 of the 46 drugs approved by FDA came from the WuXi customers. As WuXi continues to help push transformative solutions to humankind, the company will strive to refine its world- class, open access platform to enable the continued success of its customers and to accelerate the creation of better treatments for patients. Dr. Jason Liu is the Senior Vice President and head of Lab Testing Division at WuXi AppTec Inc., a global healthcare/CRO/biotech company. Dr. Liu is a seasoned executive with over 20 years of experience in clinical diagnostic, medical device, and life science. Previously he worked at Hologic-Gen Probe, Life Technologies-Applied Biosystems, and Bio-Rad. Dr. Liu received his Ph.D. in Molecular Biology & Human Genetics from Loma Linda University, MBA from Pepperdine University, and BA in Biochemistry from Shandong University. Dr. Tse received his B.S., M.S., and Ph.D. degrees from the University of Wisconsin-Madison. He served as Assistant Professor of Pharmacy at Rutgers University and prior to joining WuXi AppTec was Vice President of Drug Metabolism & Bioanalytics at Novartis Pharma. He has published over 130 research articles and six books. Dr. Tse served on the Board of Directors of International Consortium for Innovation and Quality in Pharmaceutical Development (IQC), and is a Fellow of AAPS, APRS and ACCP. “Insights & Implications from the J.P. Morgan Healthcare Conference.” J.P. Morgan. 2018. Web.